When screenwriter Steven Knight dipped his toe into directing with last year's Hummingbird, it felt more like a development for Jason Statham, who continues to incrementally expand his range as an actor while still making films that could broadly be described as the same. Locke feels more like the calling card film for Knight, getting more mileage out of a limited set-up than some more experienced directors could manage. While all the raves you've heard about it are true, it's also true that the less you know about that set-up, the more you'll enjoy the film. With that in mind, it's probably safest to say that Ivan Locke is a foreman who's on the eve of the biggest day of his career- the biggest cement pour in UK history- but he's driving hundreds of miles in the opposite direction in his BMW. Unable to turn around or change destination, he tries to make the best of his situation, and a catastrophic mistake that has led him on this journey, through phone conversations with his colleagues and loved ones. There's something inherently more theatrical than cinematic about the premise of this one, but something would definitely have been lost if you were just seeing an actor inside a chassis on a stage. 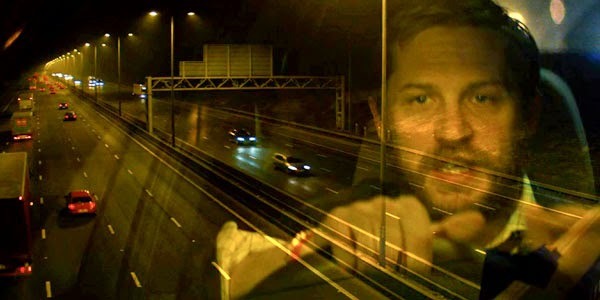 Locke can only stare out at the light-polluted M6 from behind the wheel as his life falls apart, and Knight and his director of photography Haris Zambarloukos capture that long dark stretch of dual carriageway to marvellously claustrophobic effect. The script firmly establishes that there's no turning back for our hero, and Tom Hardy just cements it (no pun intended) with his towering performance in the lead role. As the only character on-screen, he has to carry the film on those thigh-width shoulders, and this is a truly commanding performance. 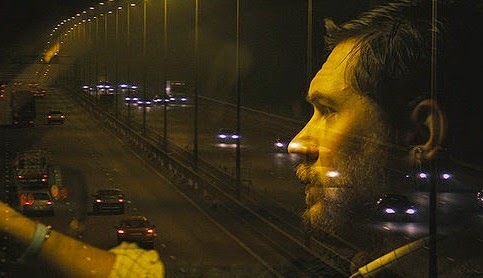 Without going into details about the challenges he's facing, he tackles all of them with an almost detached stoicism- having made a pivotal choice so early on in the film, he spends almost all of the rest of the time offering no more reassurance to his devastated correspondents than to say "the traffic is OK."
Having a Welsh accent really adds to the difficulty level, but as accents go, he carries if off far better than his dulcet tones as Bane in The Dark Knight Rises. Seeing as how you spend 90 minutes in a car with him, it's to the film's enormous advantage that he inhabits the character within about two minutes of getting on the phone. While he's the only character on-screen, he's admirably supported in superb voice-only performances by Olivia Colman, Ruth Wilson, Tom Holland and Bill Milner. But it's Andrew Scott who really stands out as Donal, a colleague of Locke's, who alternately aids and exasperates the foreman in the run-up to the pivotal pour. Although the drama is solid throughout, these are the conversations that are the most enjoyable. But the tension doesn't really release in the moments where Locke yells out and vents on his car horn or at Donal, or allows some emotion to crack through his determined mask. Instead, these moments only deepen his plight, because he's powerless to affect his situation, other than over the phone, and his composure is really his only asset. When Knight tips his protagonist into such a steep spiral, it's easy to get anxious about whether or not he'll stick the landing, but despite the other reviewers' complaints about the understated finale, it's the only way the film really could have ended without selling out on its premise. This is one of those scripts that starts the story at just the right moment, and ends it as early as it can, given the depth of the trouble that Locke is in. The only time Knight puts a foot wrong is in having him rage at an empty back seat in order to give us some exposition about his father, but even as that wears a bit thin, it's an indulgence that can be permitted of a film that never abuses its limited setting as an excuse for high melodrama. Yeah, funnily enough, there aren't a lot of different images to illustrate this one. 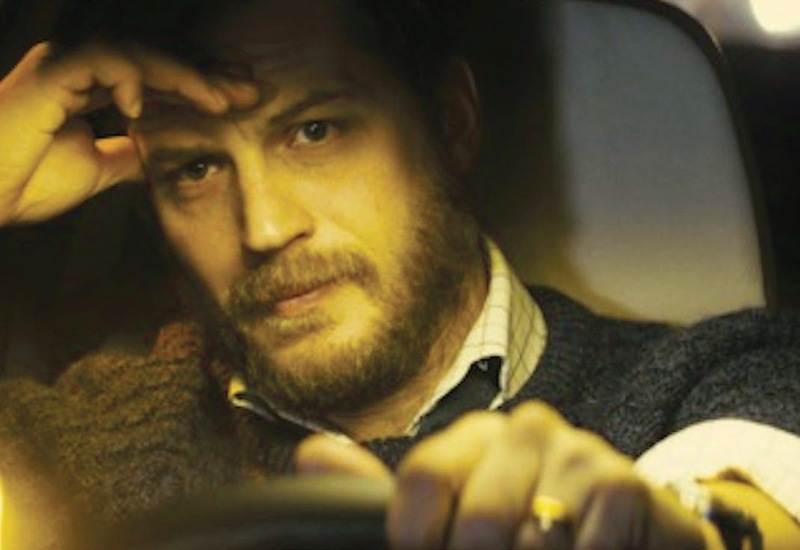 It's hard to be surprised by such an acclaimed film, but Locke really is an unexpected pleasure. By the sheer might of keeping the viewer's attention rapt single-handedly for the duration, it's hard to imagine that there'll be a better lead performance this year than Tom Hardy's turn in this. Knight has created a fascinating character in Ivan Locke, a man whose habitual reliability comes across in every moment of his one enormous betrayal, and then put the knife into him. If it wouldn't sound completely terrible to call it an emotional thriller, then that's what this would be, and the result is understated, but spellbinding. Locke is still showing in cinemas nationwide. If you've seen Locke, why not share your comments below? Quite aside from being so good, has there been a better threat in any film this year than the earful Locke gives Donal, involving the pavement saw?